If you added two or more image with the same file name to the project then Extreme Thumbnail Generator will ask you to rename one of them when your gallery is generated. You can enter the new file name for the second image yourself, if you want, but Extreme Thumbnail Generator offers you the automatic image renaming. There are two ways to automatically name the next image in the Extreme Thumbnail Generator - add prefix and/or suffix or add a number (with optional prefix and suffix). You an make Extreme Thumbnail Generator automatically add some text at the beginning of the file name (prefix) or at the end of the file name (suffix). To add a prefix to the image file name check the Add prefix to the image file name box and enter the prefix text into the edit field. To add a suffix to the image file name check the Add suffix to the image file name box and enter the suffix text into the edit field. 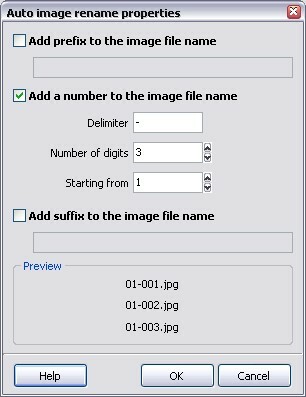 Another way to automatically rename the images in the gallery is to add a number to the image file name. Check the Add a number to the image file box first. Then enter the text that will be placed between the original file name and the number into the Delimiter field and specify the parameters of the number using the Number of digits and Starting from fields. The prefix and suffix can also be used with the number.